Despite how cute these little ladies actually did end up coming out (sigh of relief) I, in fact, HATE octopus..es? Octopi? What's the plural of octopus? I have two octopuses? I have two octopi? I think it's octopi. Is it? My computer is trying to tell me I'm wrong. Honestly, I'm too lazy to really figure it out...soooooo, octopi is what I'm going with. About Octopus-es-pi. I hate them. Like a lot. They (among other creepy sea creatures) are one of the main reasons I like to spend my days on land. What are the others, you ask? Sharks <--big one. Sting Ray (ahem...Steve Irwin???) Jelly Fish. THESE FLIPPING CREEPY SUCKERS. And, Octopi. I have this extremely weird thing about putting my body (or legs...or feet for that matter) into a body of water I cannot see the bottom of. Who knows what flesh eating/stinging/sucking swimming sea thing wants to nibble on me and try me out for size!? I'm so weirded out by this, that I like to day-nightmare (not daydream, day-nightmare) about falling off some cruise in the middle of the ocean...at night...and treading water trying not to pee myself while I impatiently wait for someone to rescue me. I envision all the darkness and deep dark waters below me...and what creep-tastic things (like giant squid or octopi) are looking up at me thinking, "YUM!" I mean, I'm pretty good with other creepy crawlies. Spiders? Eh...they can be scary...I've experienced some "AHHHHHHHHHH KILL IT NOW!" moments. Snakes? Ehhhh..I mean I'm not a fan, but I'm no Indiana Jones when it comes to them. But octopus, I'm talking REAL octopus...are some scary and uber ugly looking things! And they're SMART! Have you ever seen the youtube video of the octopus in a tank at a marine life place? If not, let me clue you in. Weeks went by where the people running the place just couldn't for the life of them understand where all their fish went. Every morning they'd come in the room, and low and behold more fish would be missing. Suspecting burglary, they set up a hidden camera on the fish tank. To their amazement what they found was the octopus in the tank across the room, SQUEEEEEEEEZING himself through this ridiculously tiny space in his tank/lid...creepily crawling down his tank with his suction legs, slithering over to the fish tank, crawling up...and eating the fish. I AM NOT KIDDING. And that's an octopus in a tank. On a much smaller scale. Who knows what types of ugly HUGE ones are lurking in the blue abyss. Don't really want to find out! I won't even eat them. Octopus sushi? No freaking thank you. Get those horrid things away from me. Same with shark. Gaaaaaw. 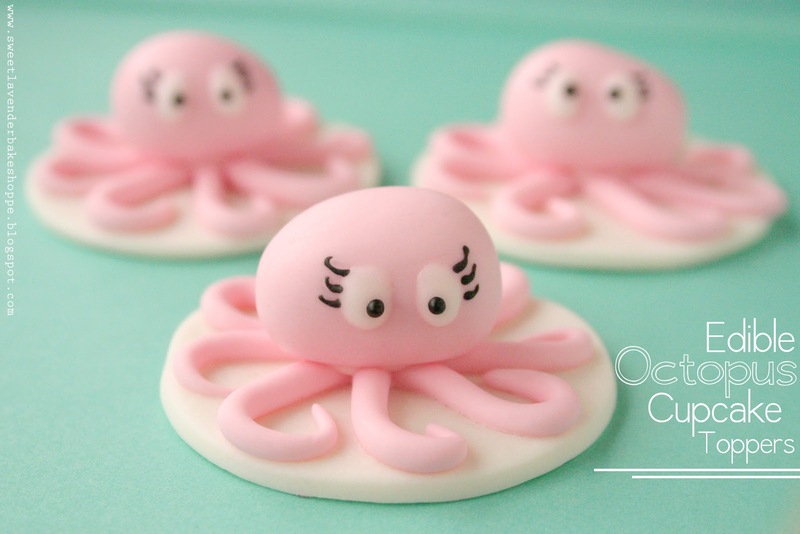 Anywho...when octopi are made into cupcake toppers? TOTALLY CUTE! Waaaaaaaay different story! Plus, when colored in pink and adorned with little octopus eyelashes? Come on- who can pass those up? I'll tell you one thing- if I was in the ocean and these LITTLE guys..er...girls came swimming by, I'd say to myself, "Now those are some super cute little octopi. Look at their little eyelashes! Lovely." I'm proud to offer these beauties on my Etsy shop! Let's take a look at how they were made shall we? 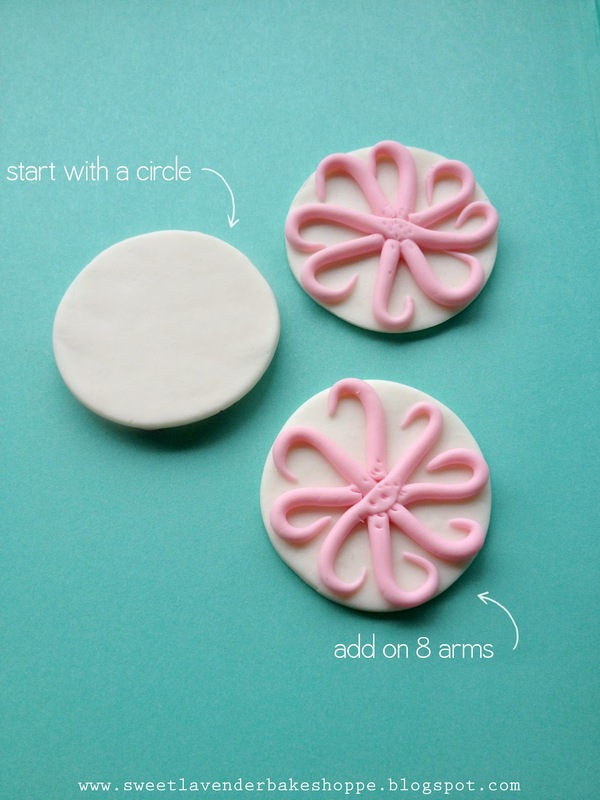 First off, I cut out white 2" circles out of my beloved gum paste. After rolling 8 little super cute ("cute" being the operative word here) pink octopi leggies, I adhered them to the circle with royal icing. 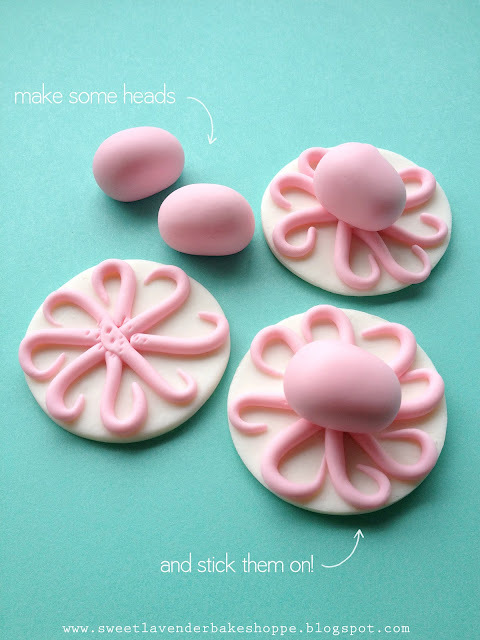 Next, I made the CUTE little octopi heads out of gum paste, and adhered them with royal icing. Then with more royal icing, I piped white eyes, and then finished with black pupils. Because I KNOW a good octopus would have cute eyes like this. Even better? Eyelashes. Every octopus needs dainty eyelashes. Viola! Little lovely lady octopi. Available here, for you to purchase! Available on Etsy! Click here! These are totally fit for a cupcake. Yes, I agree, not a fan of the octopi! Not even in the slightest! But these are definitely cute so they can stay!! I'm in love! 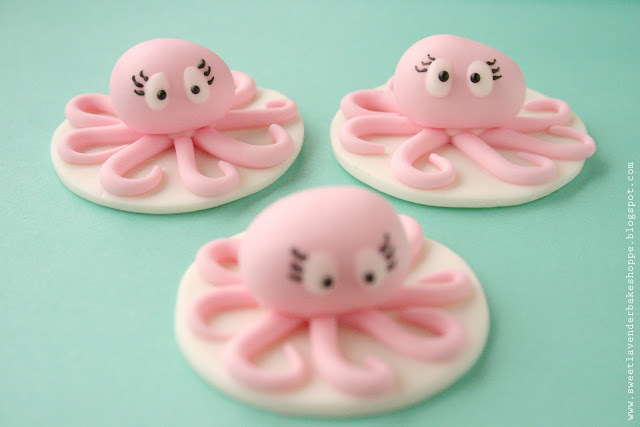 I seriously want to throw an octopus party. My water fear is eels! They always find me when I am snorkeling... and i FA-REAK out! I've had some scary fish swim near me and I'm fine, but not with the icky eels. ALthough I do wonder now what I would do if an octopus swam by me???? ALl those legs? what if they wrapped around me??? YIKES!!!!!!!!!! I have been meaning to tell you...I was so excited when I received my little pink ocean gals :) Can't wait to use them at the party this sat and I will send you some pictures. Thanks so much! They are almost too cute to eat! I have been meaning to you that I was tickled pink when I saw my cute little ocean gals! I can't wait to use them this Sat :) I will send pics. Thanks so much! They are almost too cute to eat! OH LOVELY!!! I've been waiting to see if you received them! SO SO SO Happy to hear you're a happy customer! YAY!!! PLEASE send pics! I'd love to use them on the blog! Any ideas on how to make little shark cupcake toppers for a 2 year old party? 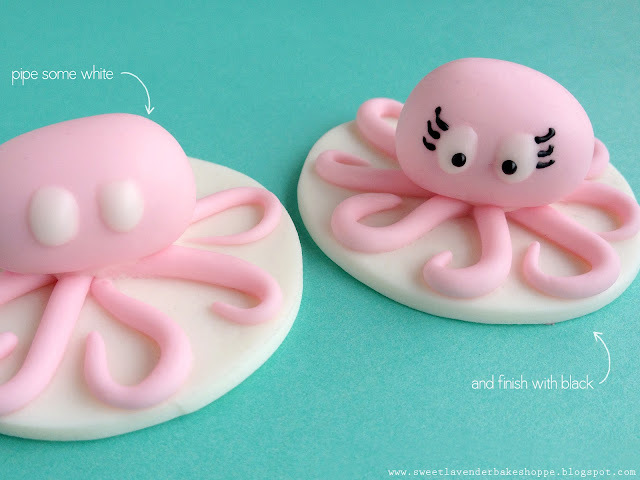 LOVELY!Octopus can be so cute?